If you are pregnant or you have recently given birth, you might be trying to figure out how to lose that baby weight quickly and safely after having a baby. Well, it turns out that there are a few fairly simple strategies that you can follow to get your pre-baby body back, and those strategies are discussed below. Like anyone else, if you want to lose the extra weight that you are carrying, you need to go on a healthy diet. But it is important to keep in mind that, after a pregnancy, your body has been through a lot, and if you are breastfeeding your baby, you need to ensure that you get enough calories and nutrients every day as well. Translation: no fad diets and no extreme dieting allowed. • Focus on eating plenty of whole grains, vegetables, fruits, and lean protein. Those foods are more dense in calories than processed foods, so you can eat less but still feel full. • Aim to get around 1,500 calories in per day, along with 38 grams of fiber, 130 grams of carbohydrates, and 149 grams of protein if you are not breastfeeding or exercising. If you are breastfeeding and exercising, you will need to up those numbers. • If you follow the tips above, you may start to notice that, by the third week of your diet, you are losing some weight. If you are not seeing the results that you want, just stay patient and consider reducing your portion sizes. • Don’t deprive yourself of food. Over the course of a month of eating healthy, the baby weight should start to fade. Don’t feel guilty about eating five or even six times a day. As long as you are snacking healthy and choosing whole food ingredients for your meals, you will slim down before you know it. Like post-pregnancy dieting, post-pregnancy exercise requires a bit of extra patience. 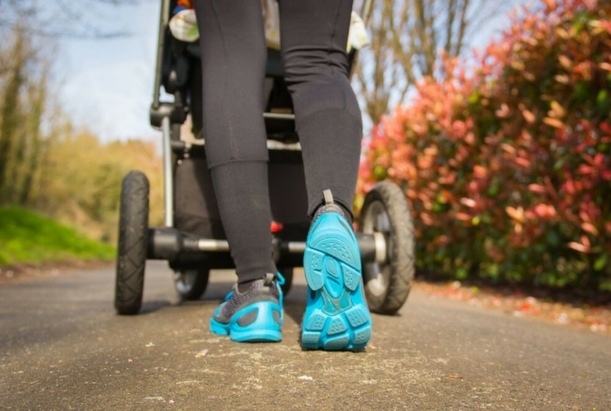 As a new mom, you will be deprived of sleep, your schedule will be very different from what it used to be, and you might even feel a little overwhelmed, so exercise is likely going to be the last thing that you are really motivated to do. And that’s totally fine. According to experts, your body isn’t truly ready to do some serious workouts until roughly six weeks after you have your baby. If you had a C-section, you will need to wait even longer. • Make cardio a priority, as it will help you get your heart rate up, burn more calories, and lose that baby weight efficiently. You don’t need to go to the gym to do cardio either; instead, you could take your baby for walks in the stroller or even dance at home. If you have a treadmill, stationary bike, or elliptical at home, make it a point to use it a few times a week. Otherwise, there’s nothing wrong with heading to the gym to take a cardio class or use their equipment. Hey, you could use the break! • To get your belly back to its pre-baby shape, consider adding crunches to your workout routine. Just be sure to start easy by doing only about 10 crunches, as you don’t want to overdo it at the beginning. As soon as you could perform that single set of 10 crunches with ease, add another 10. And then add another 10, and another. Keep going and you’ll have those abs back in no time. • Finally, lifting light dumbbells at home is a great way to tone your muscles (though lifting your baby will also be a good shoulders and arms workout). Squats and lunges don’t even require any weight, yet they could help you tone up your lower body and burn additional calories. Staying hydrated is extremely important when it comes to maintaining your overall health, especially after you have a baby. But did you know that getting enough water into your diet every day could even help you drop those extra baby pounds more easily? It’s true! • Aim to drink around 72 ounces of water every day. That translates to about nine 8oz. glasses per day. • If you are not used to drinking a lot of water every day, it may be difficult to do it at first, but don’t worry. Just start slow, by drinking as much as you can. Get yourself into a routine of sipping water throughout the day and, before you know, you will be hitting that 72-ounce goal. Consider keeping a bottle of water near you all the time, even when you are out and about, as simply seeing it could help remind you to drink. • As you hydrate your body, your metabolism will be supported, and getting all of that water into your body could even help to speed up your metabolism, leading to increased calorie and fat burning even while you are at rest. • Drinking plenty of water is also a good strategy when it comes to losing weight because it could help you feel full, and that could make it easier to eat less and hit your daily calorie goals with a little less effort. In the end, it’s all about consistency when it comes to losing the baby weight. Just like anything else in life, if you’re determined and focused, and if you put in the effort every day to reach your goals, you will eventually meet them. And with the right diet and exercise plan in place, you’ll be able to reach those goals even more quickly than you probably first imagined. • Keep in mind that the same routine won’t work for every new mom, so you have to find what works for you. You’ll likely have to work around your baby’s schedule too. So even if you just squeeze in a 10-minute workout here and there throughout the day while your baby is napping, that’s progress. • You don’t need to force yourself into an exercise routine that you can’t stand. If you like going for long walks outside to get some fresh air, go for it. If you prefer exercising in the comfort of home, do it every day. If you prefer the lively environment of the local gym, that’s fine too. If you like what you’re doing, it will be easier to remain consistent and get results. • Be patient, as weight loss always takes time. Stick to eating right, controlling your portions, staying physically active, getting enough rest, and drinking plenty of water. Doing so could support your overall health and allow you to achieve the balance in your daily life that will help your body heal and slim down. So, there you have it: losing the baby weight doesn’t have to be an insurmountable hurdle. With the right strategy and plenty of consistent effort, you’ll be showing off your body again before you know it.